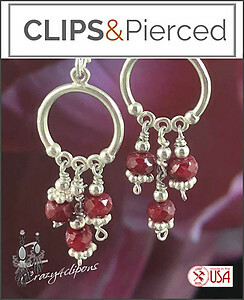 Features: Cinnamon red with a romantic flair and bitty rubies. What more could you want? Our "Cinnamon bites" earrings will sooth your calm and romantic self. Made with 3 individually hand picked petite faceted ruby rondelles that dangle from a pretty sterling silver ring, everything is hand wrapped in our studio, just for you. Light and lovely, perfect for that special someone you want to share your holidays with. Specs: small faceted ruby rondelles, sterling silver mini hoop ring, sterling silver wire, sterling silver daisies and seeds.